Home > stories > 2013 Kiwi Calendar! It’s that time again when we take a look at photos from our past years adventure to put together a fun calendar. It’s hard to believe that this is our fourth time doing this. Tempus fugit! First off, I just want to say thanks to our readers who have supported our endeavors over the years by buying calendars, shirts, ebooks and headbadges. I can’t tell you how many times we’ve stayed with folks and have seen our calendars on their walls and it almost makes us teary-eyed. It means so much to us and you all do indeed keep our trips and projects going. This year’s calendar is a collection of 12 images from our trip to New Zealand. As many of you know it was a challenging trip in many ways, but the landscape was also beautiful beyond comparison. 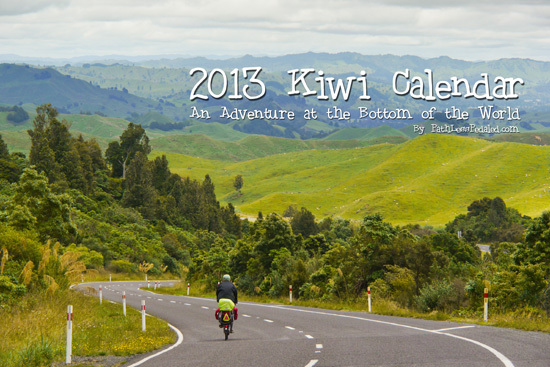 If you love bicycles, Bromptons, New Zealand or traveling to far off places, this calendar is for you. You can check out a full preview and order yours below. Be sure to leave extra time if you plan to give it as a gift!